In collaboration with key actors from different European countries, négaWatt plans on building a European energy transition scenario. This work will explore the possibility to reach carbon neutrality in Europe in 2050, as well as a 100% renewable energy mix. To support its implication in the project, négaWatt is launching a crowdfunding campaign. English subtitles are available, please activate them in the video settings. négaWatt has been working for almost 20 years on the question of energy transition. It has shown, with the négaWatt scenario, that France could reach carbon neutrality in 2050 – meaning having drastically cut its greenhouse gas emissions - through ambitious energy saving policies and by using solely renewable energies. This demonstration was made possible through the application of the négaWatt approach, which consist in focusing first on energy consumption reduction potential through sufficiency and efficiency actions, to then look at the level of development of renewable energies. This energy transition is technically possible; economically, it is desirable and socially it is indispensable. Today, we want to go further and take our action up to the European level. It is on this scale that efficient measures can be taken. Today for example, numerous energy regulations are decided in Brussels. This is the case of energy labelling of electric equipment, or norms limiting CO2 emissions from our vehicles. The scenario that négaWatt plans on developing will allow us to propose an action plan on the implementation of energy transition in Europe. It will potentially serve as a tool to support decision makers, helping them make informed choices and making sure they engage in coherent actions. Propositions for operational measures and policies will be built from this work. Building an energy scenario does not mean predicting or foreseeing the future. It is a representation of a possible evolution of our consumption habits and ways to produce energy. A scenario is a great tool to describe a pathway reaching long-term objectives. It also supports propositions of operational measures to be implemented to ensure coherent action to meet the target. With this scenario, we want to focus on the question of energy sufficiency, meaning consuming less and more wisely, without going back to using candles! The sufficiency potential is enormous, but has only been considered very little up until now in European energy policies. This project will be carried out with partners from other European countries, in order to take into account as much as possible differences between national contexts. The project is built on a collaborative approach. Partners working at the national level on the development of climate and energy strategies will commit to consistent dialogue, with the aim to strengthen coordination, capacity and mutual learning. 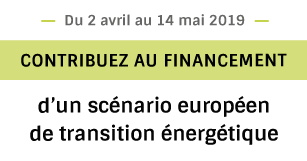 In 2018, négaWatt launched a prefiguration study around the European scenario project. This work has allowed us to precise the general framework of the project, with the creation of a network of actors around the initiative, the definition of a common strategy and methodology, the research on funding opportunities, etc. The prefiguration phase will end in Spring 2019 and will lead to the official launching of the project and its implementation phase. The objective we have set is to publish a European analysis in 2021, in order to be able to draw first conclusions and propositions of measures. The precise date of the finalisation of the scenario will depend on a number of factors which relate to the diversity of actors and countries involved in the project, as well as the access to certain data. NégaWatt is a non-for-profit association. It was created in 2001 and is run by a team of proactive members - the négaWatt company (webpage in French only) - which is made up of around twenty energy professionals and experts. The founders of the association created the organisation with the aim to show not only that another energy future is technically possible, but is also desirable for society. From 10 000€: Analysis and comparison of existing scenarios in Europe and the construction of a common modelling tool. Between 10 000€ and 25 000€: harmonisation and reinforcement of existing national scenarios. Between 25 000€ and 35 000€: aggregation of national scenarios in a common tool and development of a European scenario. The funding needed for the project is necessary to cover human resources as well as other costs related to the project implementation: travel costs, access to data bases, etc. The network of partners involved in the project will contribute to collective and individual fund-search (European programmes, foundations, and national possibilities). Each partner is in charge of covering its own working costs. This crowdfunding campaign will support négaWatt’s work in the project, which also include general management of the project and network. To support its work, négaWatt hopes to rely on multiple funding sources: crowdfunding, philanthropy and support from foundations. The foundations Watt for Change, European Climate Foundation and the Foundation for the progress of humankind have contributed to the funding of the prefiguration phase of the project. 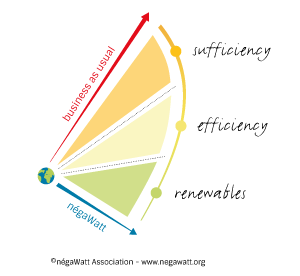 Counterparts proposed by the association for the crowdfunding campaign are consistent with négaWatt’s approach, based on sufficiency. We decided to exclude advertising goodies which do not relate to our values. However, we offer multiples documents, books or discussion time with experts from the négaWatt company, on energy sufficiency or misconceptions about energy as counterparts. As a non-for-profit association declared as serving general interest, donations to négaWatt give you access (if you are paying income tax in France) to tax reduction: 66% of the amount paid for individuals paying income tax, 60% for companies (deductible from corporate’s tax). A tax receipt will be delivered to each donator by January 2020. For donations of 1000€ or more, legislation on crowdfunding does not allow to combine both counterparts and a tax receipt. You will have to choose either one or the other.